A true Gadget for God has to pass two critical tests. Firstly, two cultures must clash  amply demonstrated here as the Last Supper of Jesus Christ, Son of God, meets size 9 knitting needles. Secondly, we need to imagine someone, somewhere, delighting in the gadget's creation. Can't you just picture it? A sweet old lady, sitting in front of a TV soap, calling out to a relative: "When I've finished Judas I'll be right with you, dear. 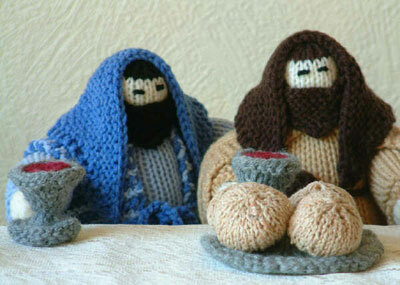 Now then, knit one, purl one..."
Pat's Patterns offers you, "Jesus, the 12 disciples, the bread, the plates, the wine goblets and wine jug... the full colour pattern for just £3.99." Amen. Knit this in remembrance of me.